As you can imagine, I get a lot of emails asking me for advice. And I’m more than happy to give it, but I do charge a fee for my knowledge and many years of experience. So, if you email me asking for advice, but don’t want to pay for it, you’ll probably have to wait until I feel like writing about that particular subject – but then your question could end up on our blog! You know that feeling that you get when your bride asks you to offer your service to her for free?? Every other person that offers a service feels the same way when you do it to them. Does that mean I don’t want people to email me with their questions? Heck no – keep them coming! I love answering them on Facebook and on my blog! 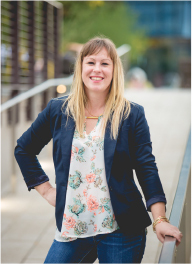 Just know that I don’t offer my services for free – and neither should you! So I got this email question last week – and it’s a good one! “How do I go about telling a bride that I can’t lower my prices…in the past I’ve been a sucker and gave discounts…only to find that they splurged on lots of other things. This particular bride has pulled the “military card” on me and I don’t know how to graciously stick to my pricing. And tips on this? Wow! How many of you are dealing with this? To start – How do you tell a bride you won’t (not can’t) lower your prices? This is a key point – because you CAN do whatever you want, but you need to change your mindset to WON’T. We’re business owners – we CAN do whatever we want with our pricing. But we shouldn’t. Here’s what we’re telling people when we offer a discount. We’re saying that our prices are flexible and we’re really not worth what we’re asking for. So much so that we can reduce our prices to suit whatever excuse your bride can dream up! And this is a really bad situation. And one that you need to avoid. Have you ever purchased something at full price and then it went on sale two days later? And rightfully so! If you’ve ever shopped at Kohl’s you may be familiar with this. They run constant sales in their stores. 50% off one day, 40% off another. It’s the luck of the draw on the discount that you’ll get on Monday, Wednesday, or even Saturday because they rely so heavily on discounting to drive sales. My issue with this is if they could offer that pair of jeans at $20 and not $40 then why the hell don’t they offer it at that price all the time? And not $30 one day, $20 another, and $40 on another. It creates a lack of confidence in their pricing and I’m sure you can see why. And it gives the distinct impression that the full price of their items are inflated on purpose – and they’re worthless as a gauge to what the real price should be. Just like when you become flexible with your prices! To answer the question of how you tell a bride that you won’t offer a discount, in its simplest form is, JUST DON’T DO IT – end of story. Defend your prices! Price yourself where you need (and want) to be and then stick with it. You might lose a bride or two to cheaper competitors. So be it! But for the most part, you won’t. Read any article on planning your own wedding and they will most likely be telling the brides that they should ask for a discount. So they might. But you don’t have to give them one. In my experience, when the bride has asked about discounts, I rarely lose them. I simply explain to them that unfortunately we do not, our prices are what they are, give them some basic reasons why, then move on to having them sign the contract and continue with the booking. Done. One key to my ability to get the prices that I ask is that I truly believe I deserve the prices I’m asking for. And so I don’t back away from them when asked about it. In fact, I’ve even written a blog on my wedding planning website that details why I charge the rates I do, including listing some of the various appointments that I attend, how many hours it takes to plan a wedding, and more. By the time the bride books a consultation with me she has usually read this blog and is already aware of why I charge what I do. If not, I simply refer to this blog and give a few more details about why my prices are what they are and we move on. I never dwell long on my rates. 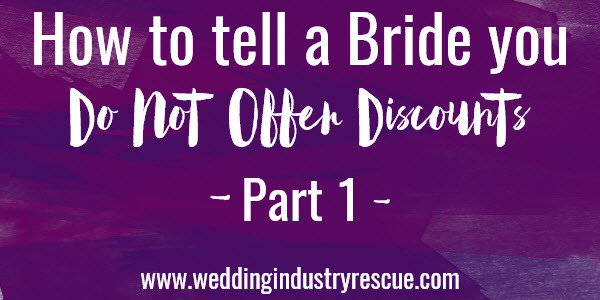 If you hesitate, flinch, cringe, talk meekly, or whatever you normally do when you are asked about discounting, the bride has you! If you feel confident that you are worth what you are charging and you can back it up you will never be uncomfortable discussing your pricing. You may have to practice this to get it right – but it’s worth practicing and perfecting! It makes a big difference in your bank account! Hello? Hello? Are You Listening To Me? ?